Q. Do The Vitamins Produce Any Negative Side Effects? A. Kerotin Hair Growth Formula is a dietary supplement that complies with FDA standards and is 100% drug free. At this time, there are no clinically proven negative side effects of taking these vitamins. Q. What Happens If You Stop Using The Vitamins? A. There are no known side effects associated with discontinuing the use of Kerotin Hair Growth Formula vitamins. Q. Are Kerotin Hair Growth Formula Vitamins Manufactured In Fda Approved Facilities? A. Kerotin Hair Growth Formula is a natural supplement, not a drug. The FDA approves medications and drugs, not dietary supplements. Kerotin Hair Growth Formula vitamins are manufactured in FDA certified facilities. These facilities are inspected and adhere to the requirements of the United States Food and Drug Administration, (FDA). Kerotin Hair Growth Formula’s blend of nutrients is designed to support and maintain the growth of the healthiest hair but it also benefits your skin and nails. Every fiber of muscle contains silica. Biotin has been the first choice of experts when hair, skin or nail tissues require nutritional support. Skin wrinkles typically appear as a result of aging processes. Skin becomes thinner and loses fat, making it less plump and smooth. Our body’s largest organ system is the Integumentary System where tissues never stop growing. Due to this, the Integumentary System has a vast nutrient requirement, which in most cases is impossible to meet from even the healthiest diet. Our product is designed to support and maintains the growth of the healthiest hair also will benefit your skin and nails. Q. 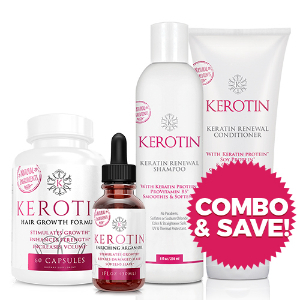 How Will Kerotin Hair Growth Formula Vitamins Make My Hair Grow Longer And Faster? A. The Kerotin Hair Growth Formula vitamins combine nutrients specifically designed to support hair and overall health. A healthy body is the ideal environment for healthy hair to thrive. Q. 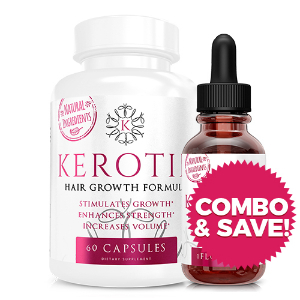 How Fast Will My Hair Grow Using Kerotin Hair Growth Formula Supplement? A. Most of our customers report 1-2 inches per month of growth. However, growth rates can vary. Q. 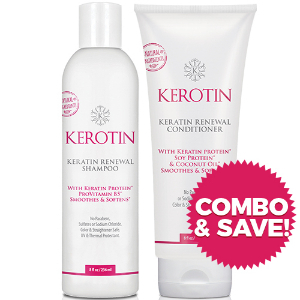 Does The Kerotin Hair Growth Formula Produce Any Other Improvements? A. Most people report improvements to their skin and nails as well. Q. Where Will Kerotin Hair Growth Formula Cause Hair Growth? A. Kerotin Hair Growth Formula won’t cause unwanted hair growth (facial hair, legs, etc.) because the cycle of hair growth differs on different areas of the body. Q. Is Hair Loss Reversible? A. Many types of hair loss are reversible. And, with proper nourishment, damaged and dormant hair follicles can be repaired and even reactivated, resulting in new hair growth. Q. Does Kerotin Hair Growth Formula Work For All Types Of Women’s Hair Loss? A. Hair loss can happen for different reasons in women and result from a variety of factors including: hormonal imbalances; stress (emotional or physical); thyroid disorders; nutritional deficiencies (typically iron or certain B vitamins); immune system problems; allergic reactions; infections; surgery; and/or side effects of some medications. Kerotin Hair Growth Formula may help regrow hair under all of these circumstances. Q. Does Kerotin Hair Growth Formula Ship To My Country? A. Yes. We ship to every country worldwide. All packages, unless otherwise stipulated, once processed, go out DHL, United States Postal Service Priority International or Express Mail International. Tracking numbers are given, but the postal service does not typically allow tracking of this number until the package has been delivered. Please note that minor adjustments to the shipping rate may be required depending upon the country of shipment and the current shipping rates. **Please allow at least 2-3 weeks for International Orders to arrive. A. We typically ship Monday-Friday and try to process orders within 48 hours (except holidays and weekends). Orders submitted on weekends or holidays will process the next business day. Sometimes due to demand orders can be delayed by increased volume during holidays and promotional weekends. Please be patient during these times as we work hard to get all orders out in a timely manner. During these times please allow 5-7 business days from the time your order is made for it to ship. All packages, unless otherwise stipulated, once processed, are shipped via DHL, United States Postal Service First Class or Priority Mail. This service provides delivery confirmation for all of our orders. All delivery times are estimated from the time your order leaves our processing center. Please allow 5-7 business days from the time the order leaves the processing center. **International Orders - Please allow at least 2-3 weeks for orders to arrive for shipments outside of the United States of America. A. Our No-Questions Asked 30-Day Money-Back Guarantee provides a hassle free way to try the product and feel the benefits. If you are unhappy for any reason simply let us know and we will provide you a complete refund up to 30 days from the day you received your order. A. This disclaimer states there is no guarantee of specific results and each person results may vary! However, Kerotin Hair Care does guarantee that if you are consistent and take the product for 30 days and don’t feel results and are happy with your purchase, we will refund your money fully. Testimonials From Women Like You! I take one pill every night and use the oil on my hair after I shower. I am amazed with the results. I have fine hair that isn't exactly thinning but it never felt very full. I bleach my hair and struggle with damage. Within days of starting this I noticed hair growing around my forehead, new growth!! My hair seems more full. I feel like it's possibly even growing more now. I am so happy that I found this. Trust the reviews. The vitamins work. My hair has less breakage, is shiny, bouncy, has extra volume, is easier to comb through, and feels strong. I receive compliments daily on how great my hair looks and how long it has grown in only a short period of time. I also love these because they come in vegetarian capsule form.